Cut the lime in two halves. Drag the lime around the top outside of the cocktail glass. Then put some salt in your hand and rotate the glass in it. Have some ice in the glass to cool it for a minute or so. Put everything except the salt but including some ice in a blender and blend it. Empty the glass of the ice and poor up the thick stuff from the blender. Done! This drink tastes a lot. It has a very strong lime taste, and also a stunning taste of tequila and raspberries. If you aren't a big fan of tequila or raspberries, then stay away! If you don't like the raspberries or the seeds in them, try the Strawberry Margarita instead. Blackberry Margarita is another variation. 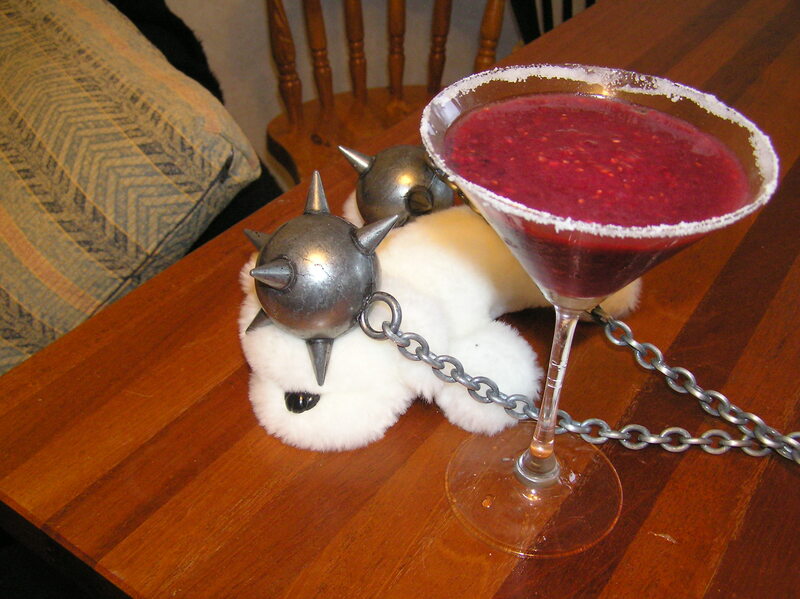 Lingonberry Margarita is a more Scandinavian version. 2008-11-21 [Thunder Cid]: I tried this one and liked it pretty well. Unfortunately I didn't have a flail to garnish. 2008-11-21 [Hedda]: Too bad! But a battle axe might work too.